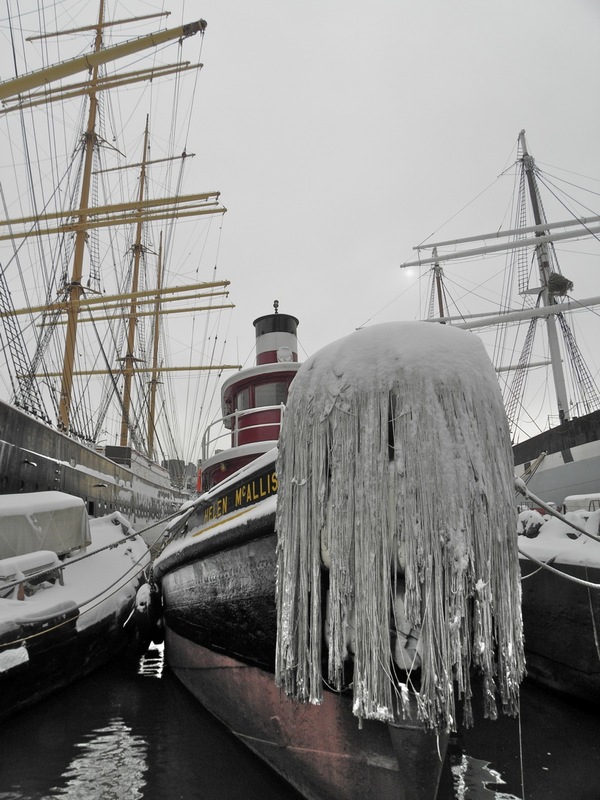 You are currently browsing the category archive for the ‘South Street Seaport’ category. 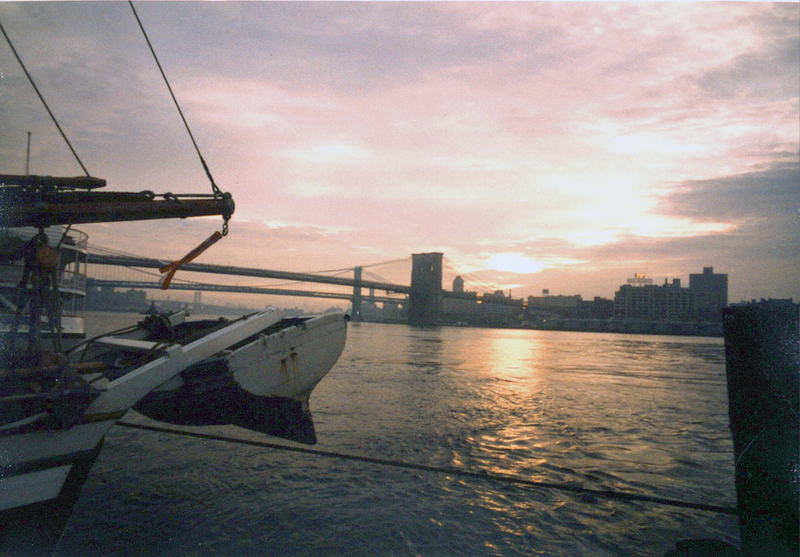 Ken came up with additional photos of his overnight in the transient slip at South Street Seaport Museum many years ago . . . so here they are. 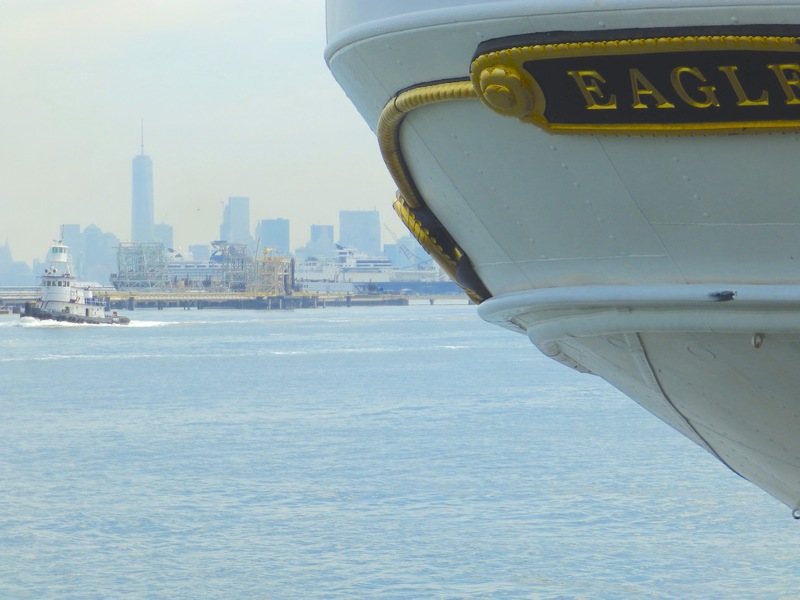 Note the Twin Towers in the background. To the right side of the photo, I’m guessing that’s a mastless Lettie G. Howard and Major General William H. Hart, now languishing along the Arthur Kill. 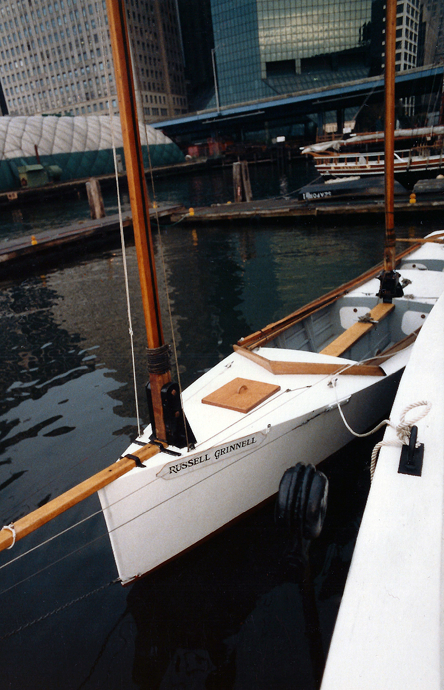 Here’s a close up of the stick lighter, identified by eastriver as Vernie S.
Russell Grinell, among other things, was an owner of schooner Pioneer before she came to SSSM. 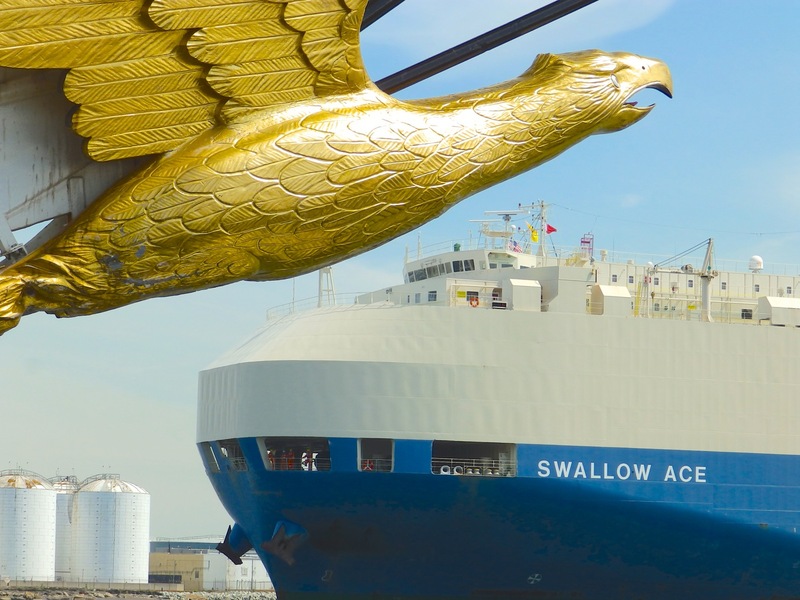 Here’s Black Pearl in the foreground, with a respectable looking eagle’s figurehead. 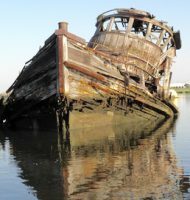 And finally, this might be the stern of Anna Christina, which sank in the “perfect storm” as mentioned in this NYTimes article. 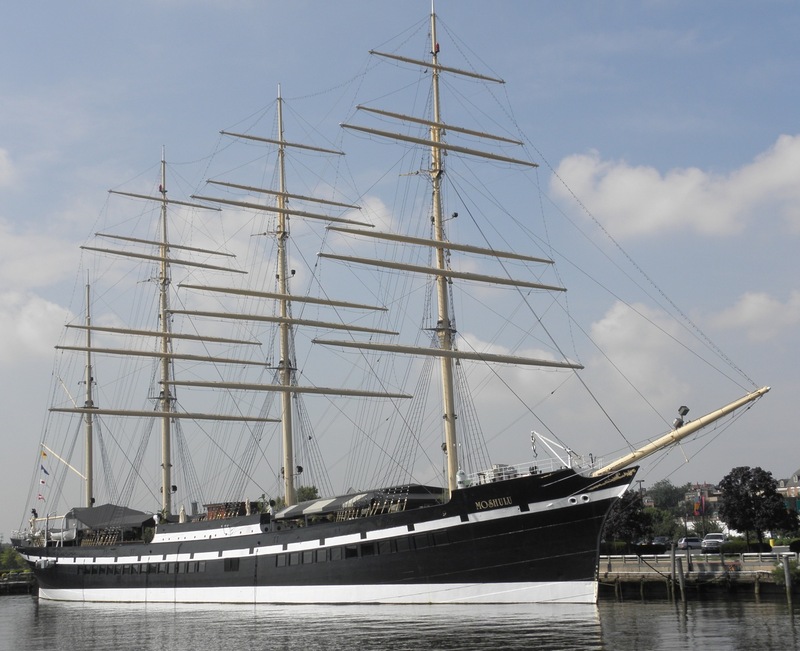 Wavertree, built 1885 in Southampton, England. Dismasted off Cape Horn 1910. 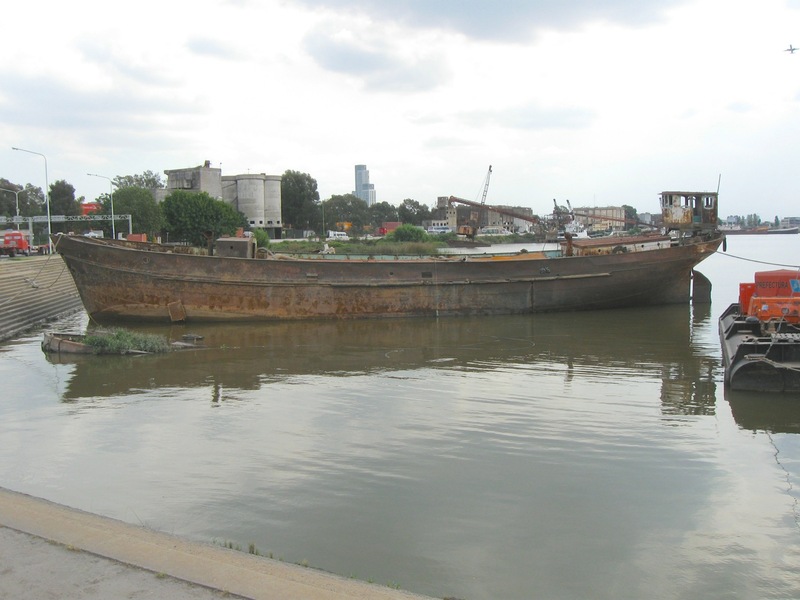 Former floating warehouse in Chile and sand barge in Argentina. Arrived in NYC’s sixth boro 1970. This will be a long visit to the yard. 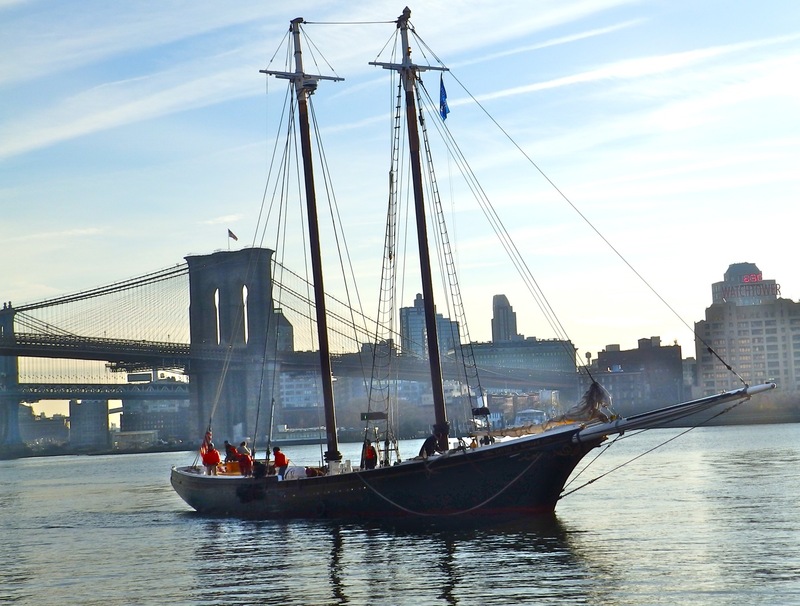 If you want to see her at the East River dock, you’ve got only about 48 more hours. 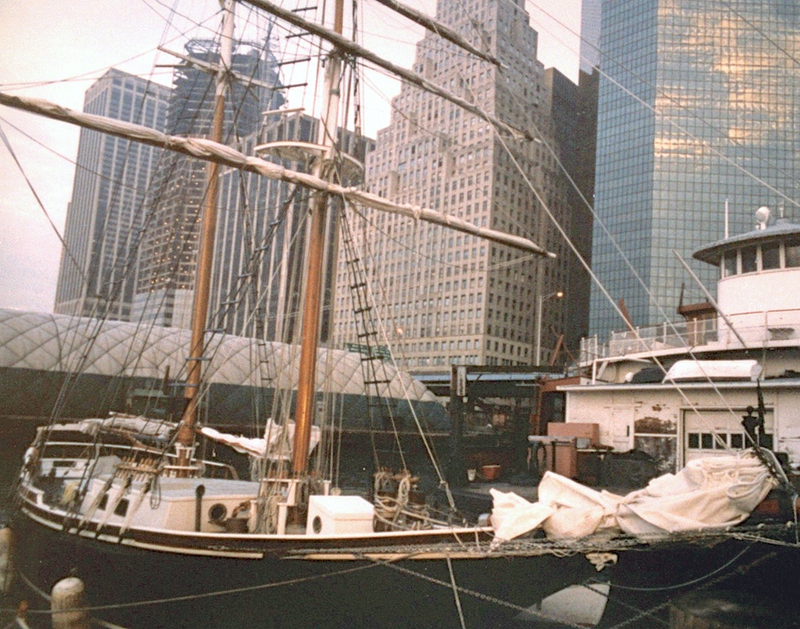 For photos of Wavertree arriving in NYC in 1970 and in Argentina before that, click here and scroll. 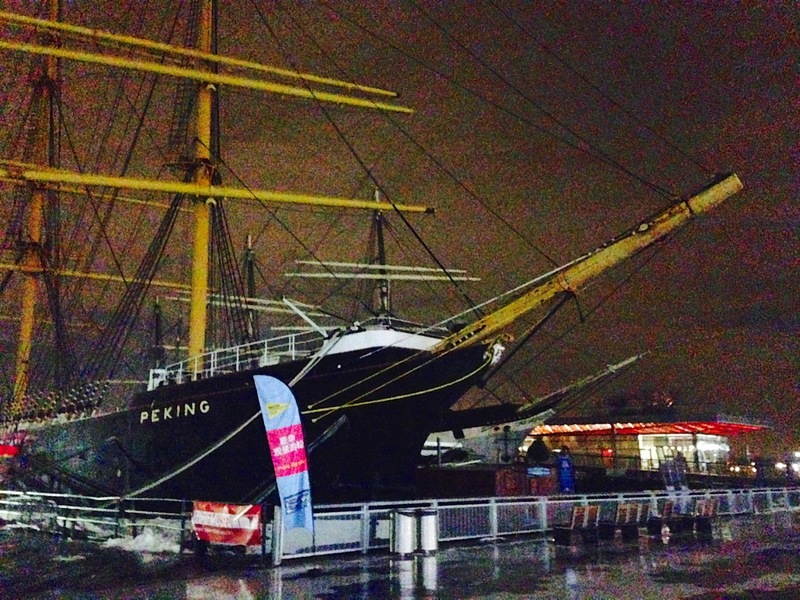 The black-hulled tall ship along Wavertree is Peking. For some photos from her last trip to the yard click here and here. Wavertree, steady as she goes. Exactly six years ago I heard a reawakening Peking . . as I wrote here, I felt a pulse, heard a breath. A warm flow began to within that shell too cold and too long. 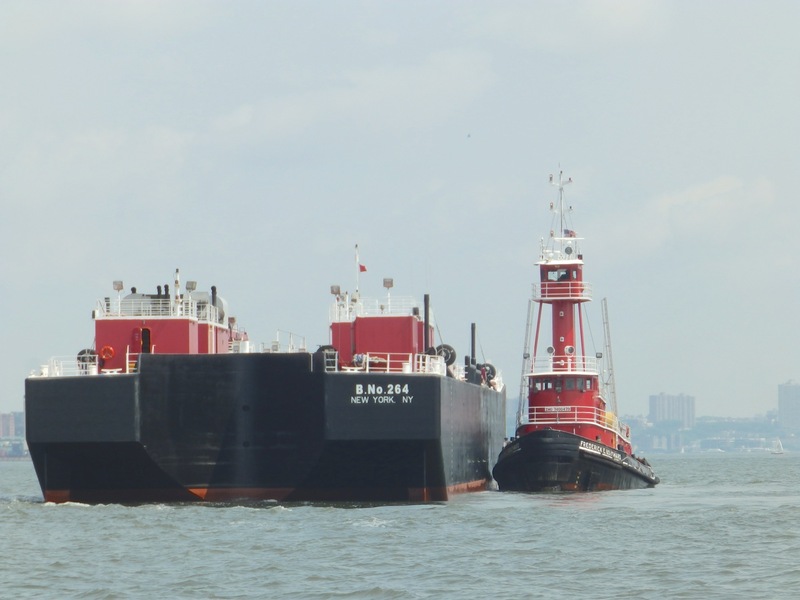 . . Peking in the Upper Bay was calling on buoyancy it once had here south of South America. I allowed myself to feel a little hope. 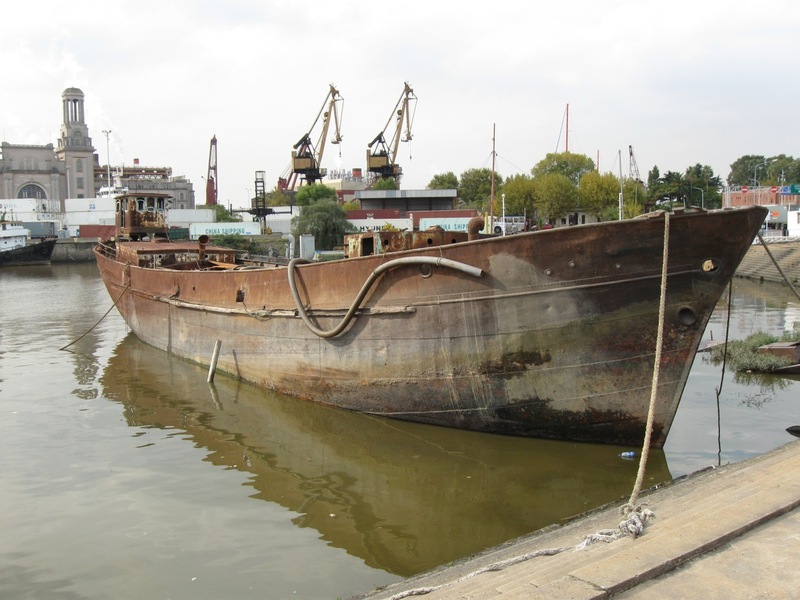 Possibly this trip to the dry dock would be a preliminary to a miraculous rebirth. But too much time has passed again . . . momentum has dissipated. Undercurrents in this article suggest the end is starting to be acknowledged. but IMHO, this is alright. Mortality stalks all of us. So here’s my proposal: let those who hold her destiny organize a decommissioning, a wake. 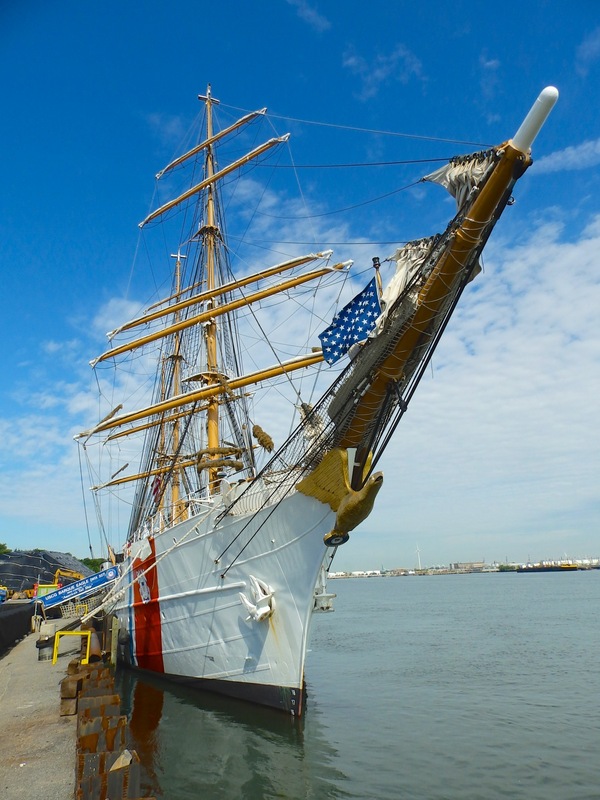 She arrived–I imagine–with some fanfare if not an official commissioning for her imagined new role in 1975 . . . first at the Narrows here and then–in November 1975, according to A Dream of Tall Ships–from the shipyard up to the East River. How about a party now . . . as then. And then . . reef her, ceremoniously. or cousin or just compatriot . . . . which would place this in what waterway? Waver Three is not my spelling, but . . . someone else’s, for which I’ll add the link soon. But here’s the story. 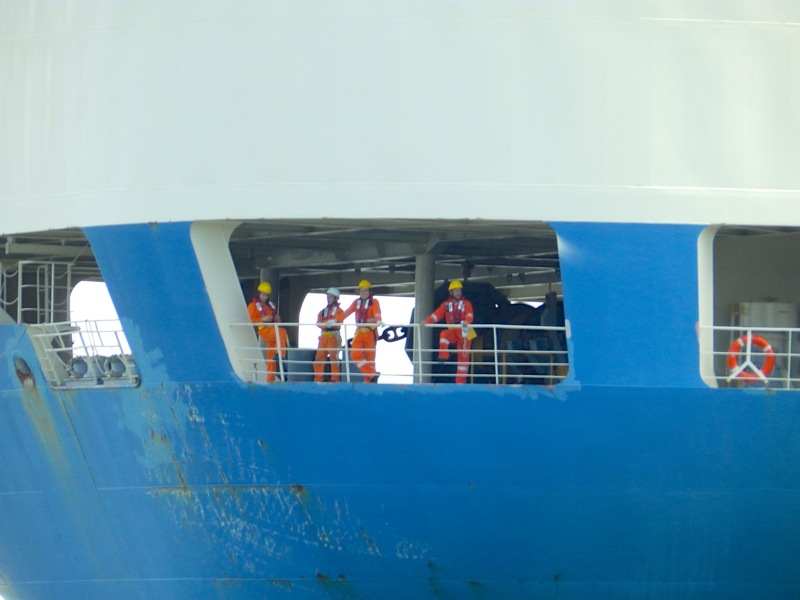 The vessel in the photos above were sent to me recently by Niek , a native of the Netherlands who followed the trail of love south to Argentina, where this vessel was recently refloated. 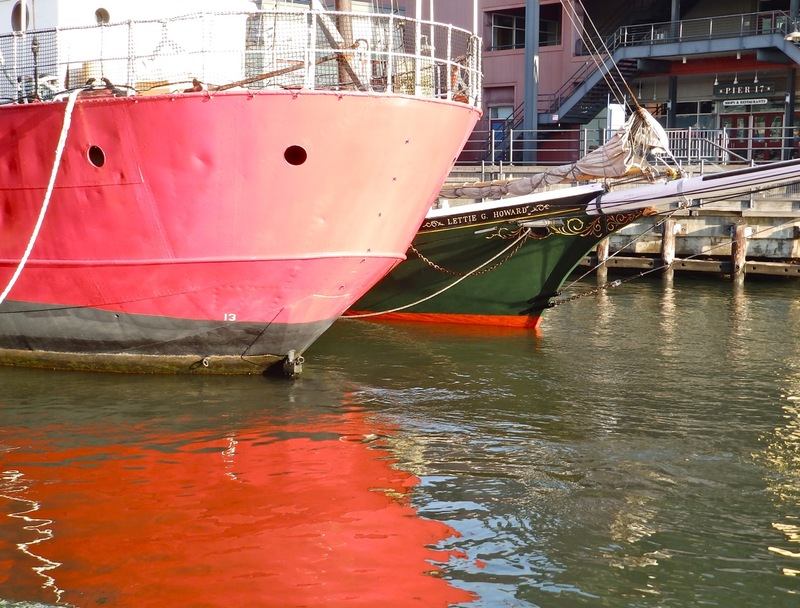 To see what Granadero (ex-Meta Ipland) looked like before being raised AND before sinking, click on this link and plod through the Spanish and German. 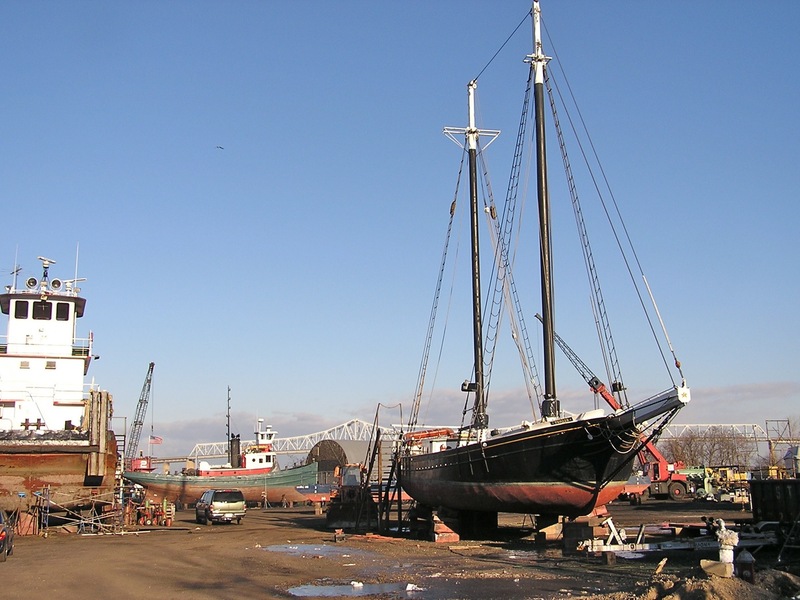 As a Dutchman living in Argentina, it’s easy to understand how Niek is interested in this century-old vessel built in his homeland. Click on this link and then do a “find” for the term ” salvemos al granadero” and you’ll read an interview in which a Ruben Roderiguez is not happy that Waver three (sic) made it out of Rio de la Plata. 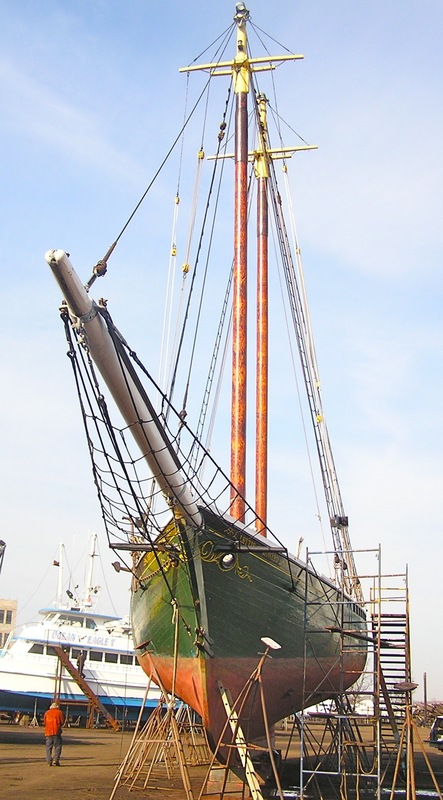 Some folks in Argentina are very proud of their maritime heritage, as evidence by this database of tall ships (A to L) and (M to Z ) that once operated there, including Granadero and Wavertree. Good to know for us, the custodians of Wavertree. Niek . .. thanks for the photos and story. First, if you’re free today and within travel distance of Lower Manhattan, do yourself a favor and attend this event, 4 p. m., a book signing by Dr. James M. Lindgren. 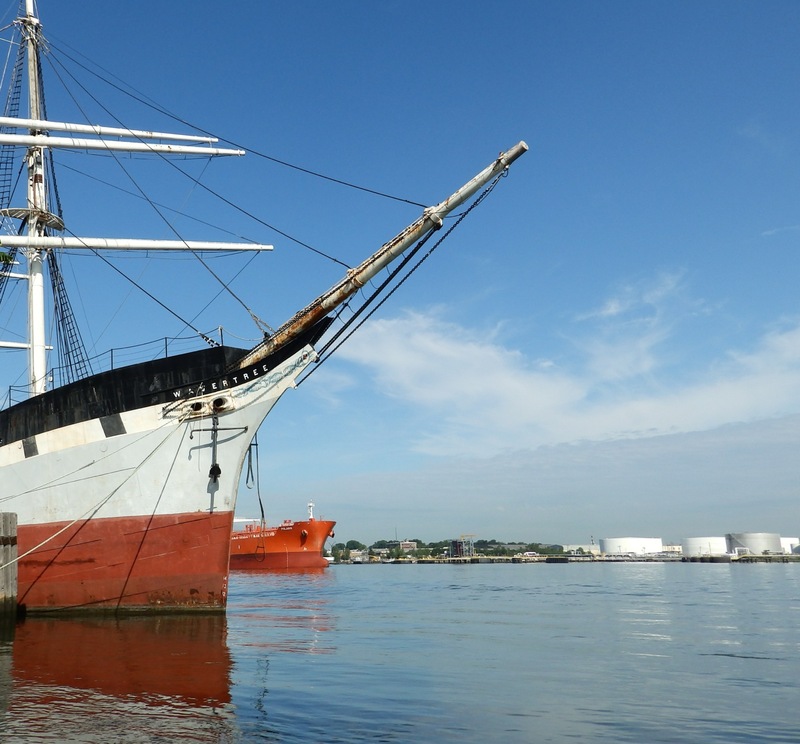 His new book is a much needed complement to Peter Stanford’s A Dream of Tall Ships, reviewed here a few months ago. 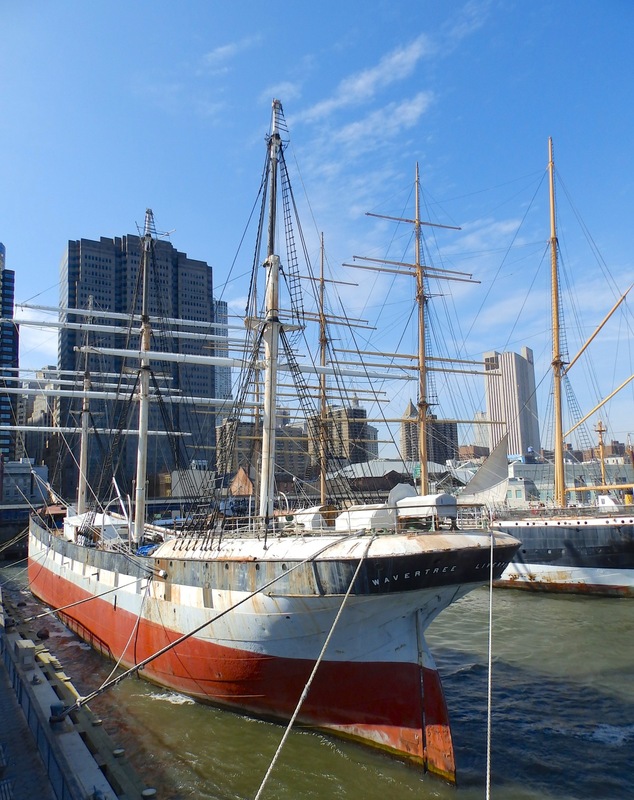 Details in Preserving South Street Seaport cover almost a half century and will enthrall anyone who’s ever volunteered at, donated to, been employed by, or attended any events of South Street Seaport Museum. Lindgren laments SSSM’s absence of institutional memory saying, “Discontinuity instead defined the Seaport’s administration.” Amen . . as a volunteer I wanted to know the historical context for what seemed to me to be museum administrations’ repeated squandering of hope despite herculean efforts on the part of volunteers and staff I knew. As my contribution to creation of memory, I offer these photos and I’d ask again for some pooling of photos about the myriad efforts of this museum over the years. 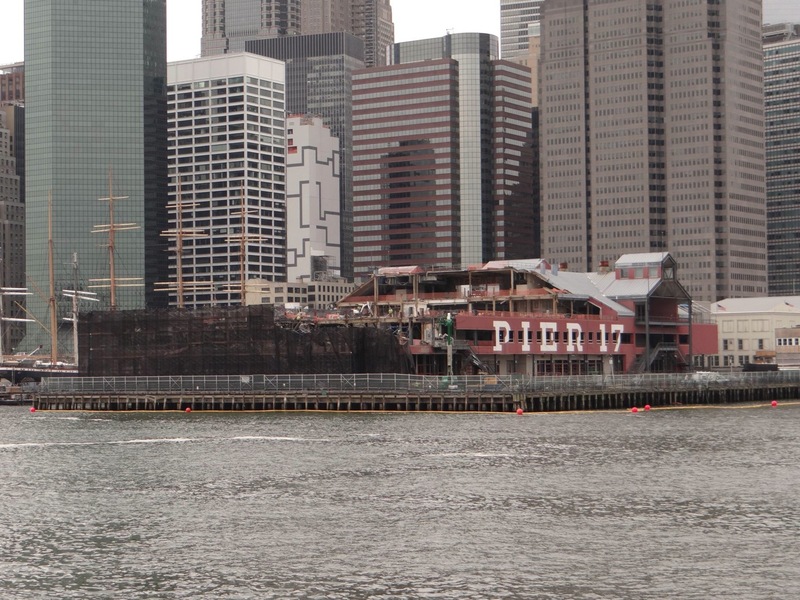 Pier 17. April 17, 2014. According to Lindgren, this mall opened on Sept 11, 1985 with a fireworks show. Its demise may by this week’s end be complete. April 12, 2014. Photo by Justin Zizes. Jan 21, 2014 . . . Lettie G. Howard returns. Sept 20, 2013. 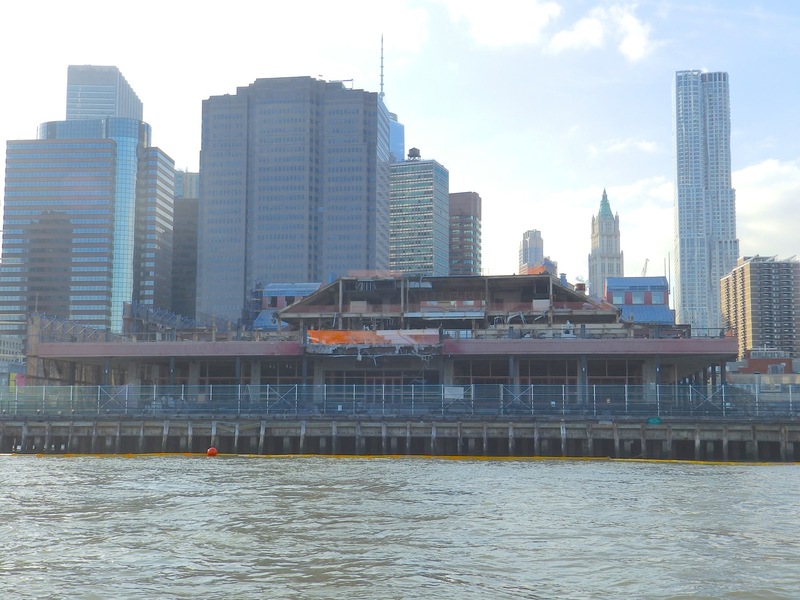 This is the last photo I ever took FROM the upper balcony of Pier 17. July 2012. 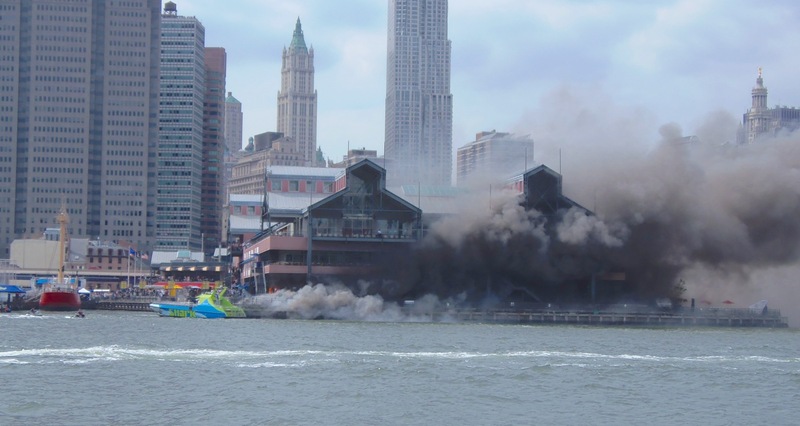 A fire had broken out on the pier, and Shark was the first on scene responder. Damage was minimal, despite appearances here. 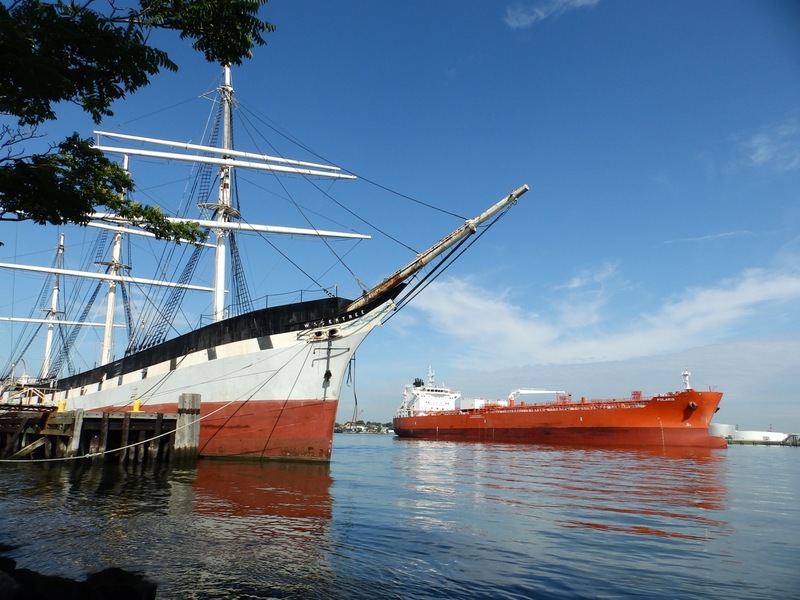 Now for some photos of vessels that have docked in the South Street area in the past half century. 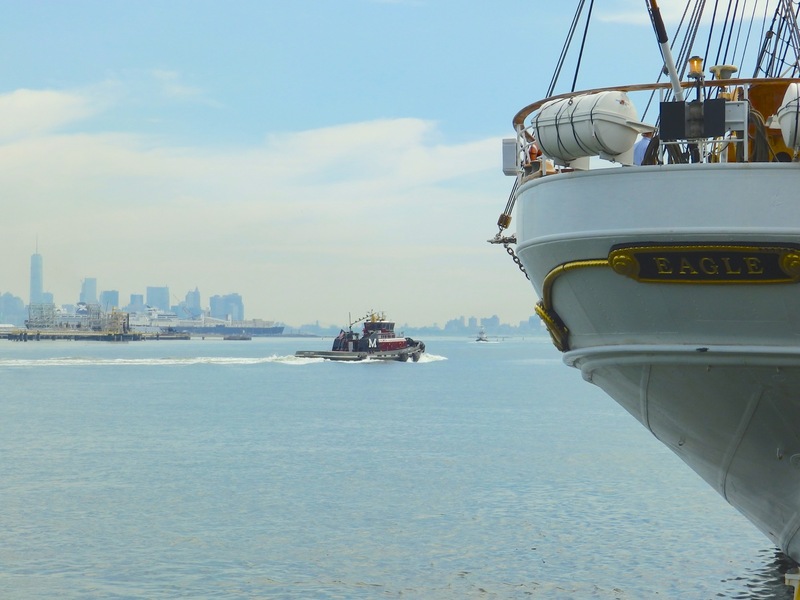 July 2012 . . . Helen McAllister departs, assisted by W. O. Decker and McAllister Responder. June 2012. 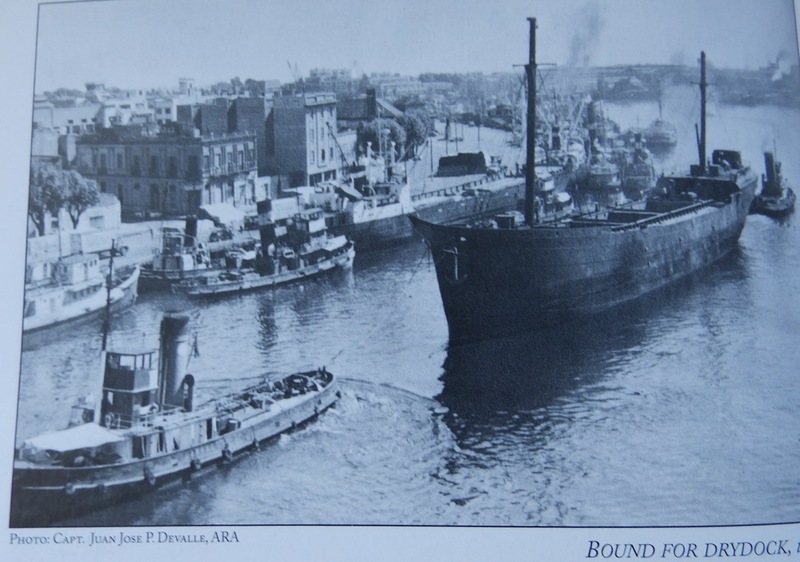 Departure of Marion M as seen from house of W. O. Decker. Photo by Jonathan Boulware. 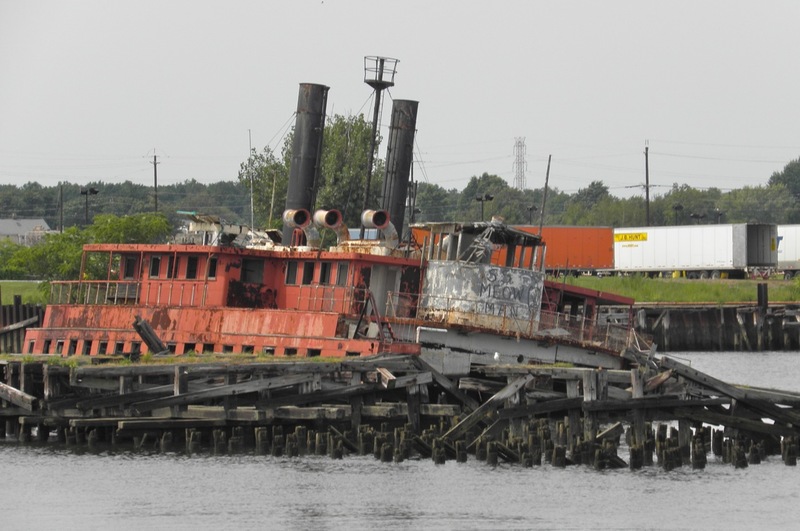 The last I knew, Marion M is being restored on the Chesapeake by a former SSSM volunteer. Lettie G. Howard hauled out in 2009. 2009. 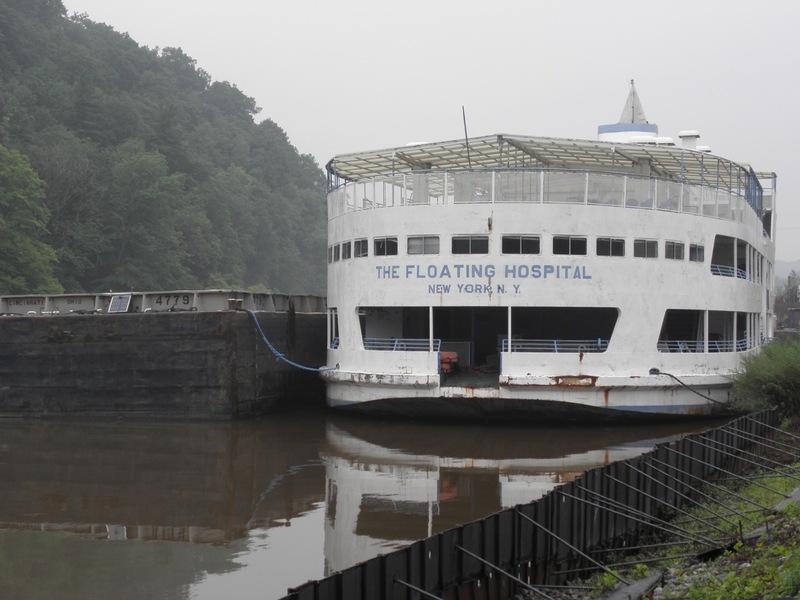 The Floating Hospital . . . was never part of the SSSM collection. 2009. Maj. Gen. Hart aka John A. Lynch aka Harlem. Helen McAllister with Peking and Wavertree. 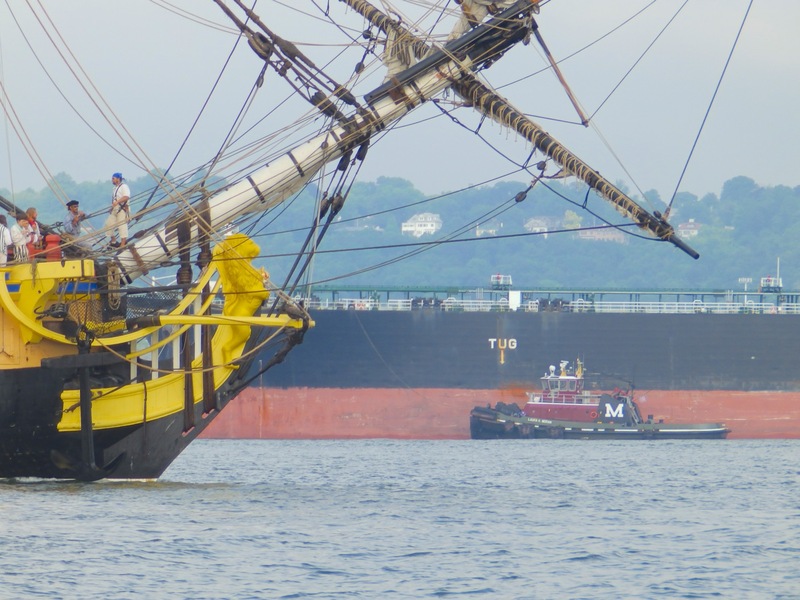 Portion of bow of Marion M along Helen‘s starboard. Mathilda posing with W. O. Decker in Kingston. 2009. 2005, I believe. 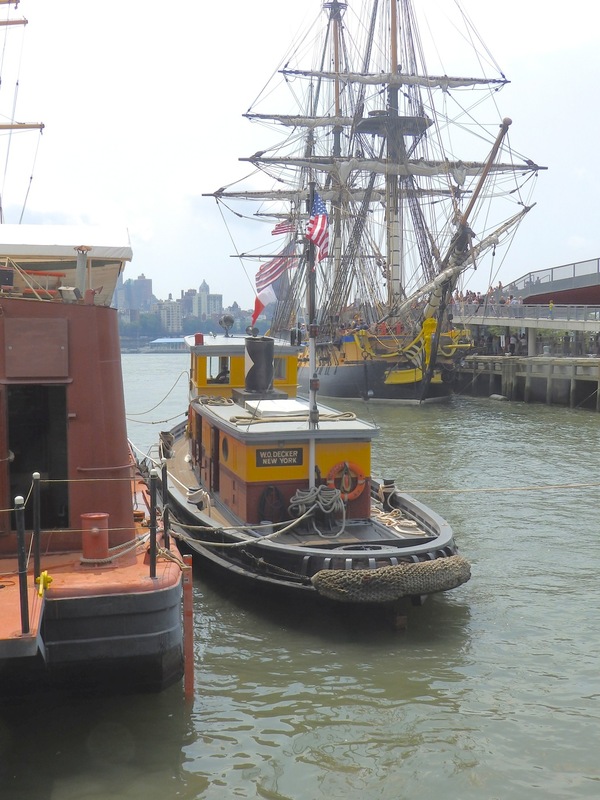 Spuyten Duyvil (not a SSSM vessel) and Pioneer. Thanks to Justin and Jonathan for use of their photos. All others by Will Van Dorp. For many stories on these vessels, that mall, and so much more, pick up or download these books and read them asap. 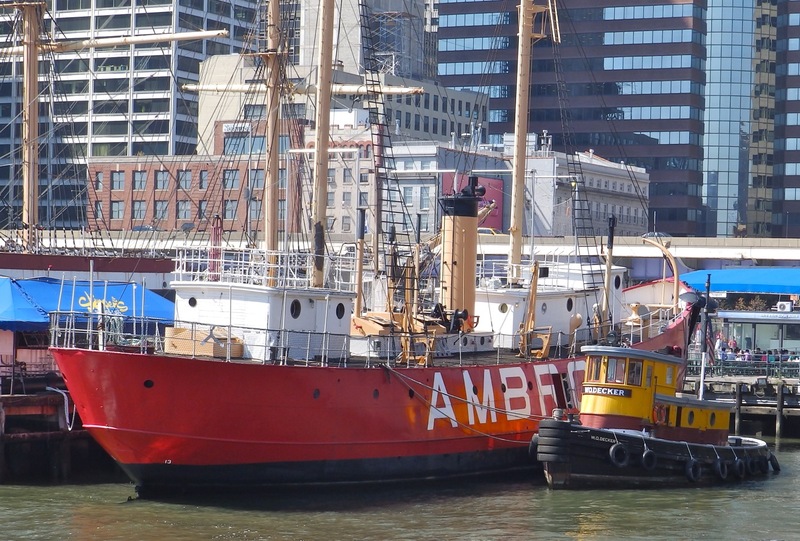 Between spring 2004 and summer 2007, I volunteered about 1000 hours at South Street Seaport Museum, or SSSM, mostly on Pioneer but also on W. O. Decker and Lettie G. Howard. 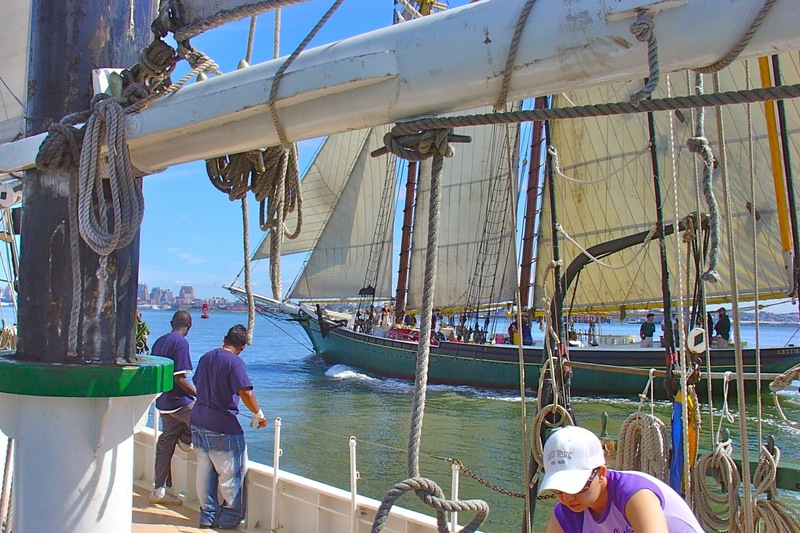 The experience was exhilarating—learning the lingo of schooner sailing and the lines and procedures, rustbusting and painting, all good for maintaining youthfulness and toning up aging muscle. Without my time at SSSM, there might never have been this blog called tugster about a place I imagine as the sixth (and primary) boro. 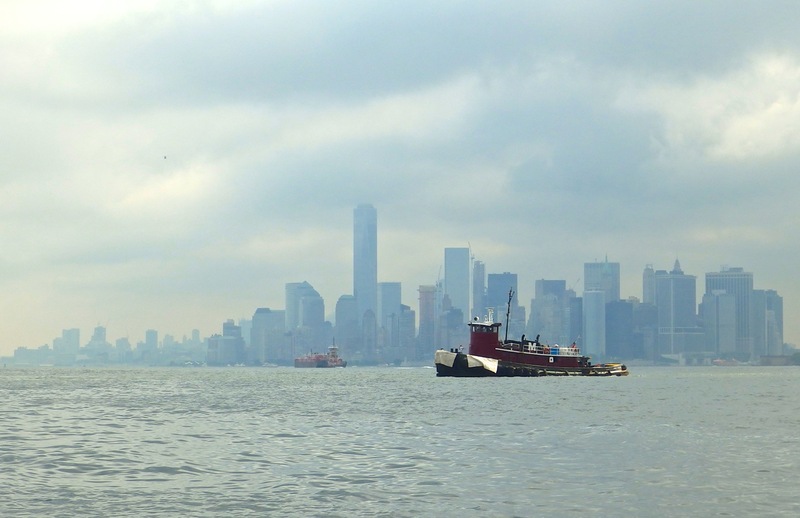 What pulled me away from volunteering was my sprouting curiosity about all the other vessels and projects and careers in the harbor with more tugboats than I could recall without the assistance of my camera. Downloading my photos after a day’s sail would lead to a night’s worth of googling, to learn what I could about the boats, companies, cargoes, and ultimately the crews. 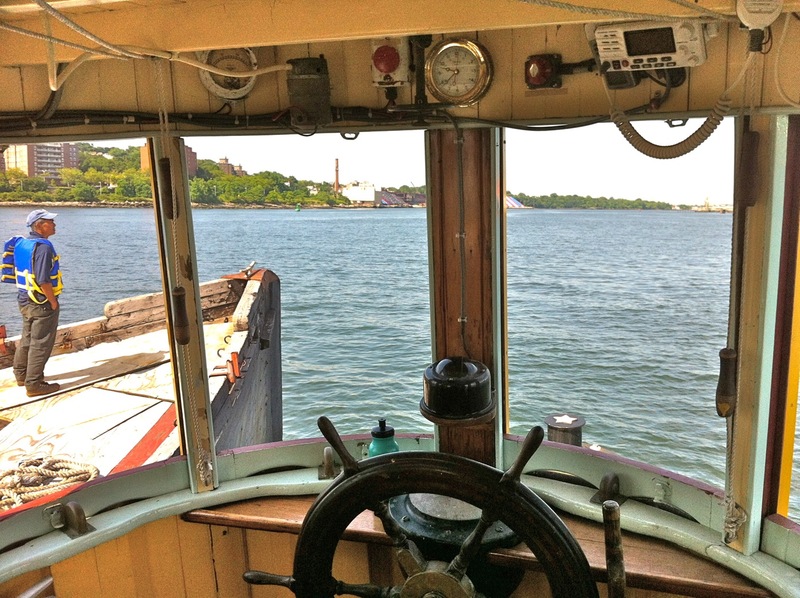 Volunteering there felt focused too exclusively on SSSM and their vessels’ tracks from Pier 16 back to Pier 16. This frustration should not have surprised me, given my lifelong wanderlust and curiosity. SSSM has stayed with me though. One sweet memory I carry of SSSM is of the stories I heard as a volunteer about the time of creation, creation of the museum, that is. But these stories came in fragments, and the gaps between have triggered lots more questions. The more I heard, the less I felt I knew. 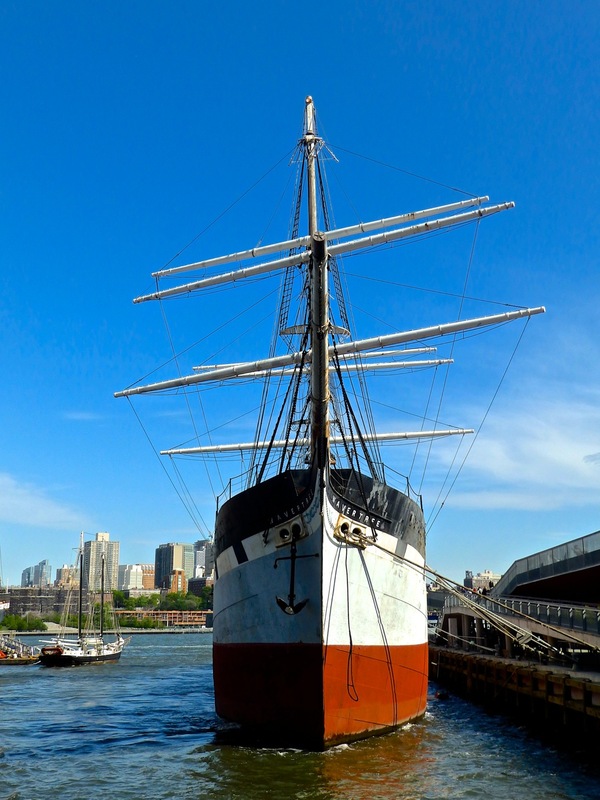 A Dream of Tall Ships, covering the time period from 1967 until 1974 in 500 pages, is like a vessel loaded deep with memories filtered through the recollections of Peter and Norma Stanford, founders of SSSM. 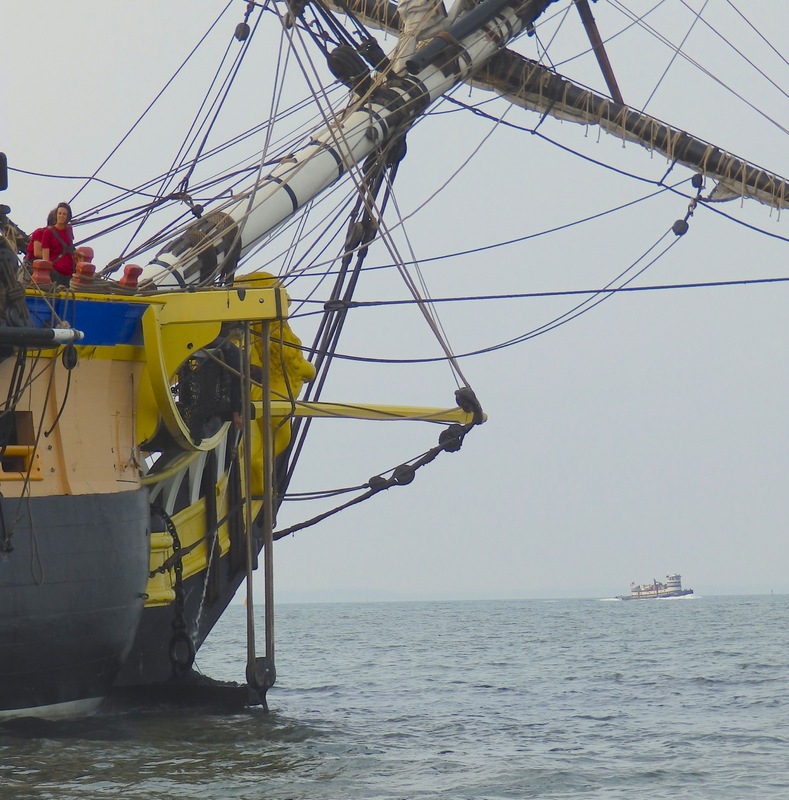 The account is detailed and peopled with legends from a half century ago, a time when nautical giants were feeling the urge to preserve what remained of commercial sail, both coastwise and global. 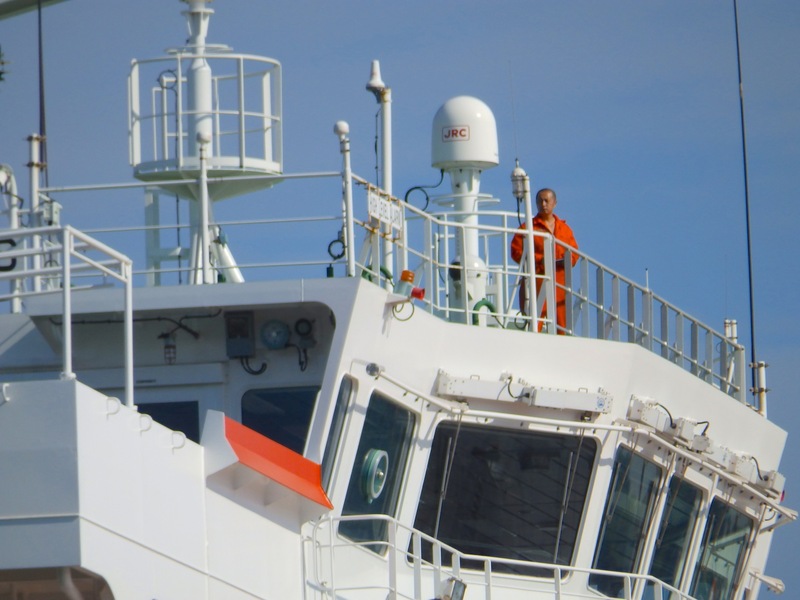 People like Alan Villiers and Karl Kortum, “ship savers” who inhabit this book, strike me as optimists who could imagine second (or “new”) lives for these old vessels built a century or more before. 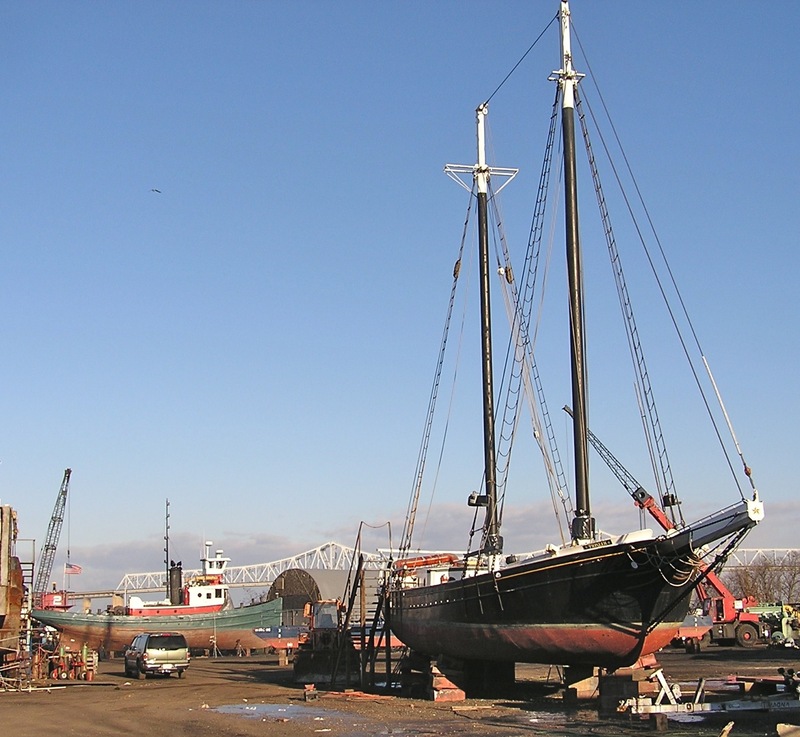 The Stanfords recall their travels to places like Punta Arenas and the old port of Buenos Aires to purchase Wavertree, one of the tall ships that seem in hibernation down at SSSM today. 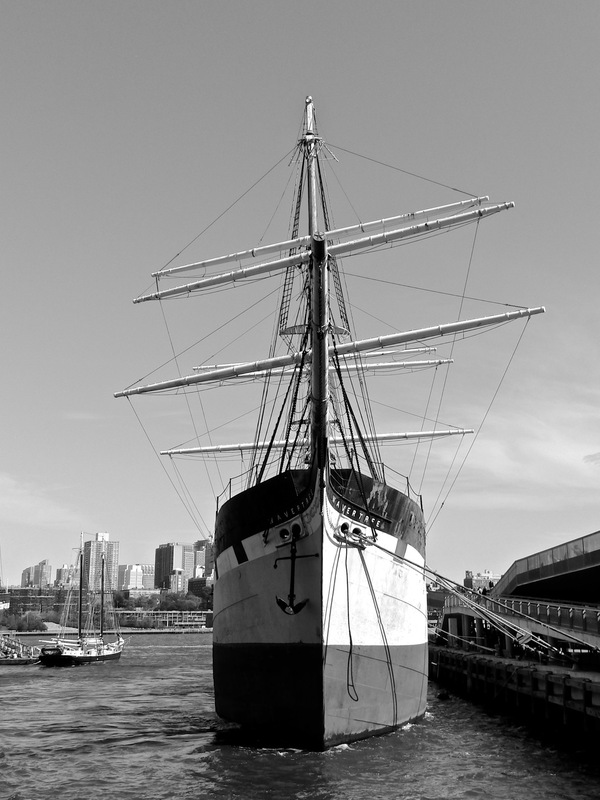 The photo below–taken from among the over 60 images in the the book, shows Wavertree in the condition SSSM acquired her. 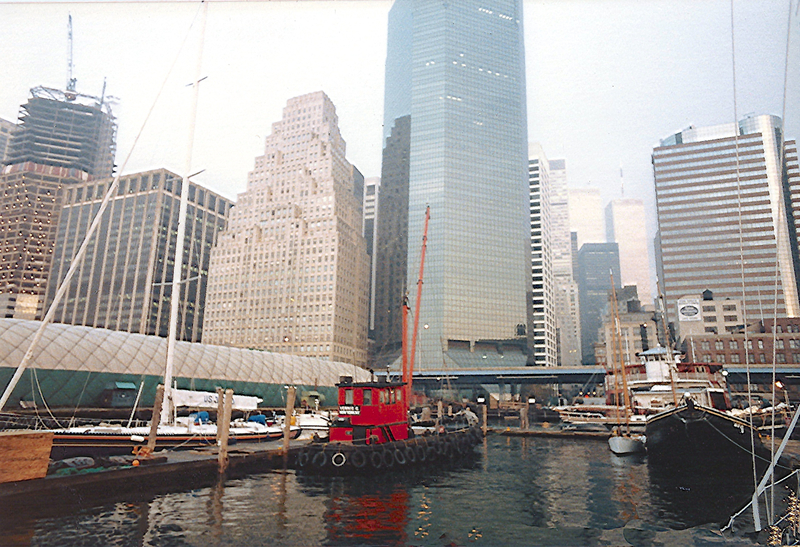 The book describes a time in the history of SSSM and New York City when it seemed that only the brightest future could lie ahead. When SSSM sponsored an event, the most powerful, brightest, wealthiest, and most generous of the city rolled up their sleeves and weighed in. In a timeline of SSSM events in the postscript pages of the book, names appearing include Jack Kaplan, Brooke Astor, as well as Laurance and David Rockefeller. Then there are giants like Pete Seeger and Burl Ives. 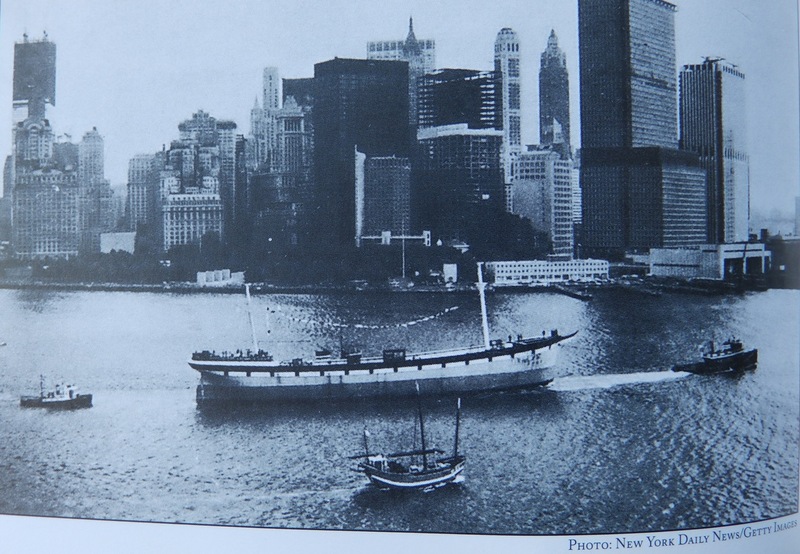 At a January 5, 1968 meeting at the Whitehall Club to launch SSSM’s James Monroe Luncheons, the pantheon of New York’s maritime industry showed up to listen to ocean historian Robert G. Albion speak. NY political elite like Mayor Lindsay were there, as was the famed naval architect Howard Chapelle. 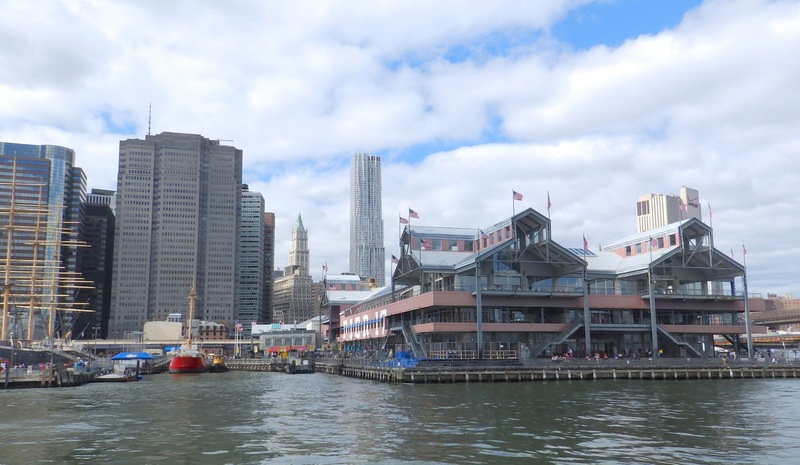 Real estate struggles existed already back at the creation, but it seemed manifest that SSSM would grow into a premier maritime institution, center of the New York State Maritime Museum, and more. Stanford documents the growing membership. 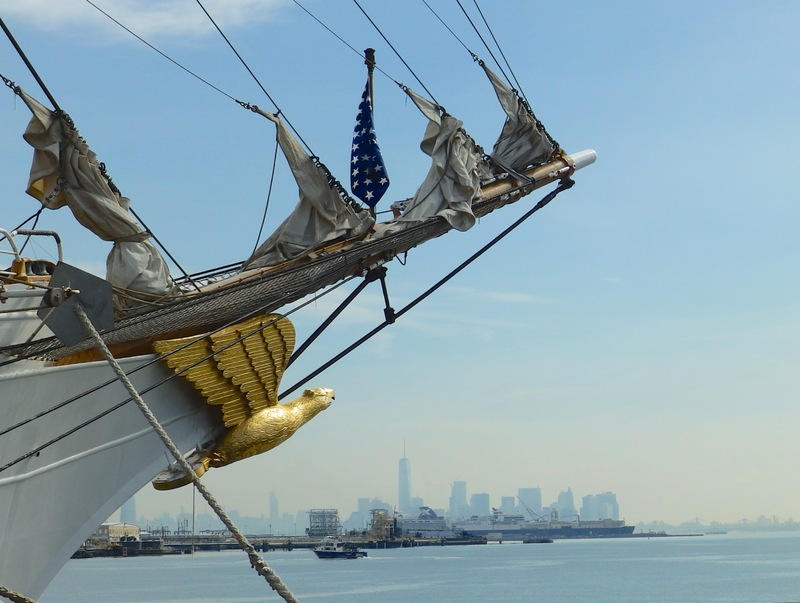 New York was heady with the growing fleet of tall ships and other interesting vessels. Exciting happenings like Sea Day seemed to spread a love of the city’s connection with the sea, an event that predates “City of Water” day. But don’t take my word for all the memories in this book. 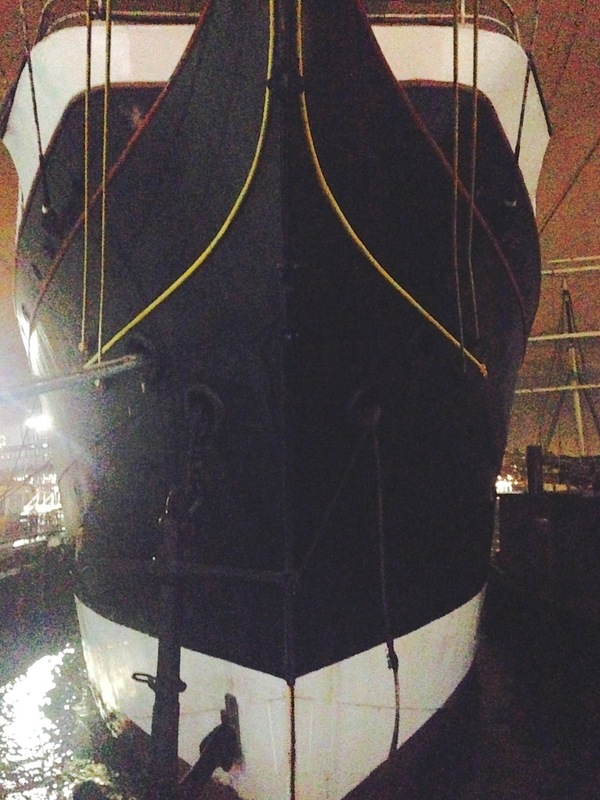 I hope enough of you read this book—skim quickly through the too-long segments about martinis and such– and maybe if enough of us start to glow again with embers long ignored, maybe new energies will again start up the dream to make SSSM a street of tall ships that will inspire seafarers of the future. 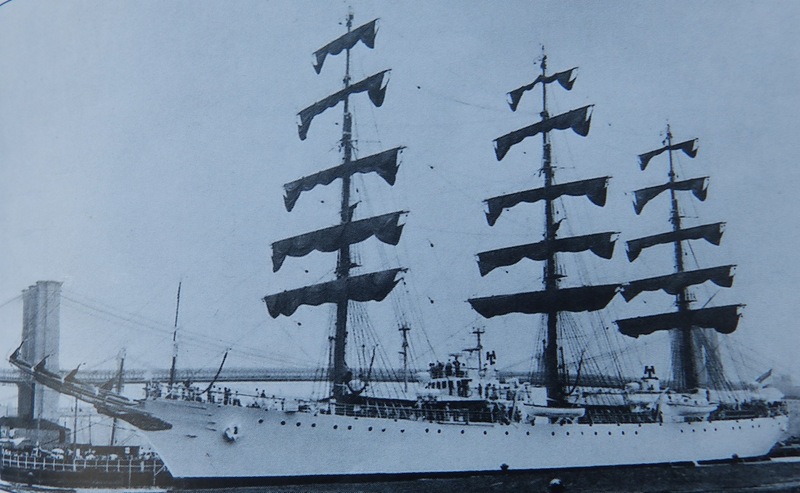 this one, showing ARA Libertad docked at the SSSM in July 1969 after delivering a portion of the Wavertree‘s topmast, shattered off in 1910 while rounding Cape Horn. Two other interesting notes about the photo below. 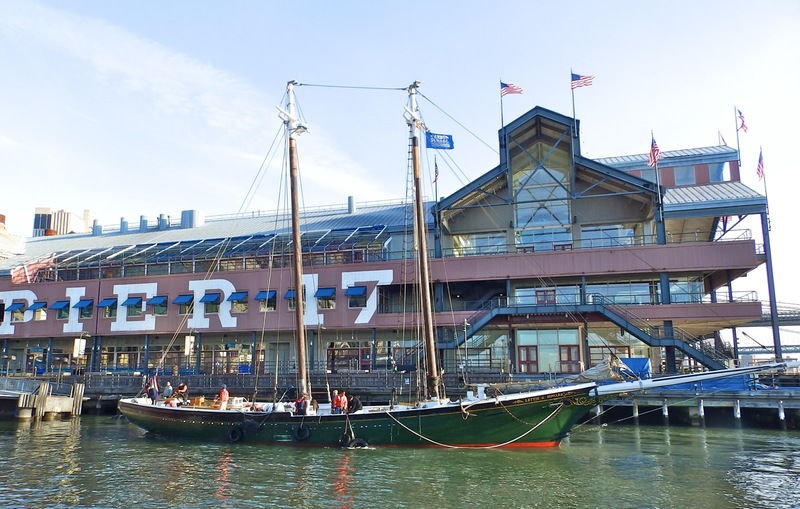 First, when the Commissioner of Ports and Terminals tried to block Libertad from docking at the SSSM pier, Libertad‘s Captain Vazquez Maiztegui responded, “Libertad will berth in New York at South Street Seaport, no other place.” Second, at around the same time, Pete Seeger and Clearwater put in there to celebrate her first arrival in New york. I immensely enjoyed this book. My only regret is that it didn’t contain 160 photos or 1600 photos. 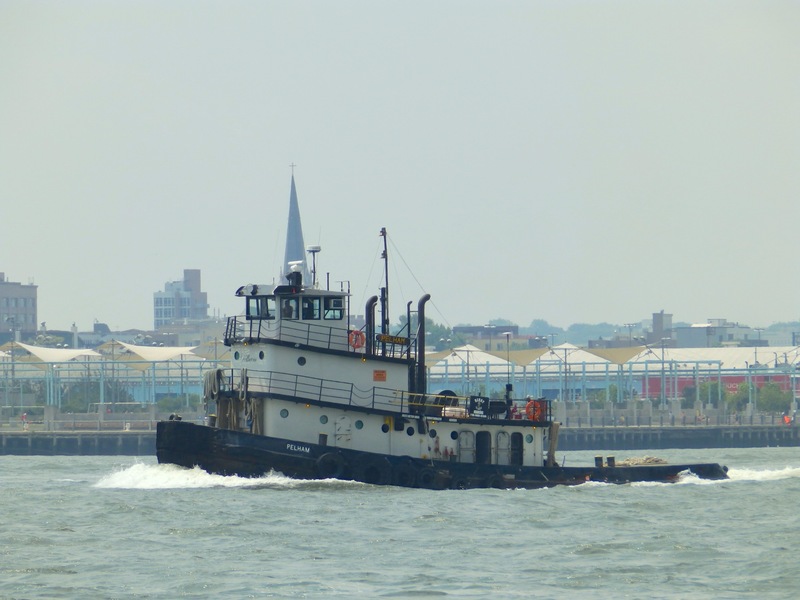 For example, on September 20, 1968, a Bronx River Towing tug delivered the vessel today known as Lettie G. Howard to Pier 16; I’d love to know more and see a photo. 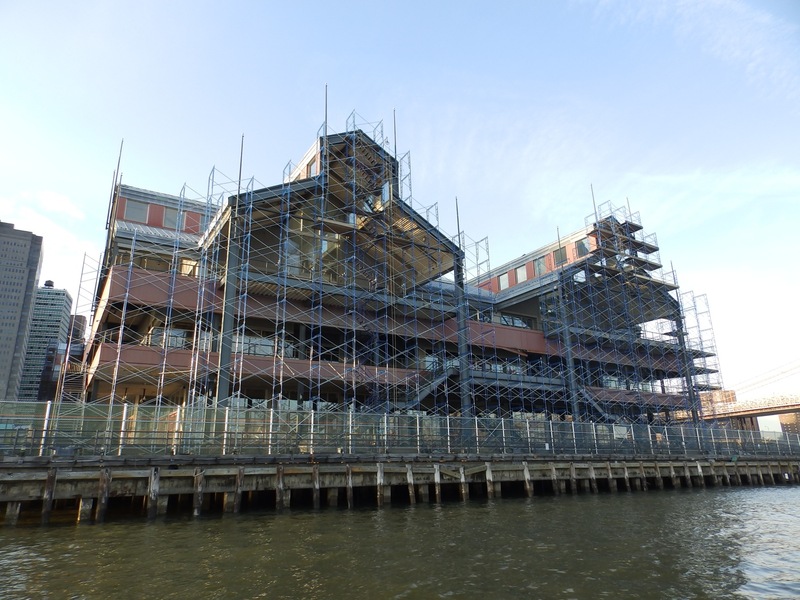 Square Rigger Bar & Grille is repeatedly mentioned; let’s see at least the facade. I’d be thrilled if an electronic addendum of photos from these early years could remedy this. 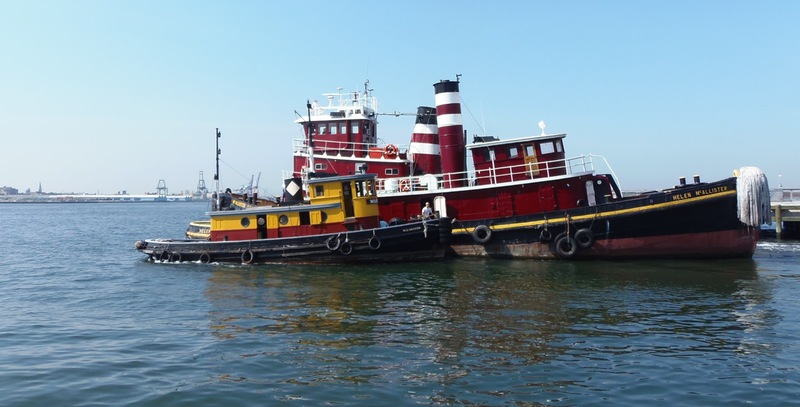 Here, here and here are two posts I’ve previously done using photos showing history of vessels in SSSM’s collection. Again, get the book and read it soon. Click here for some previous reviews I’ve posted. Three kings parades happened today in some parts of the world . . . including East Harlem, where camels walk through Manhattan streets. This blog has had a fair number of posts about queens, so here are some kings, though not Gaspar, Melchior or Belthasar. 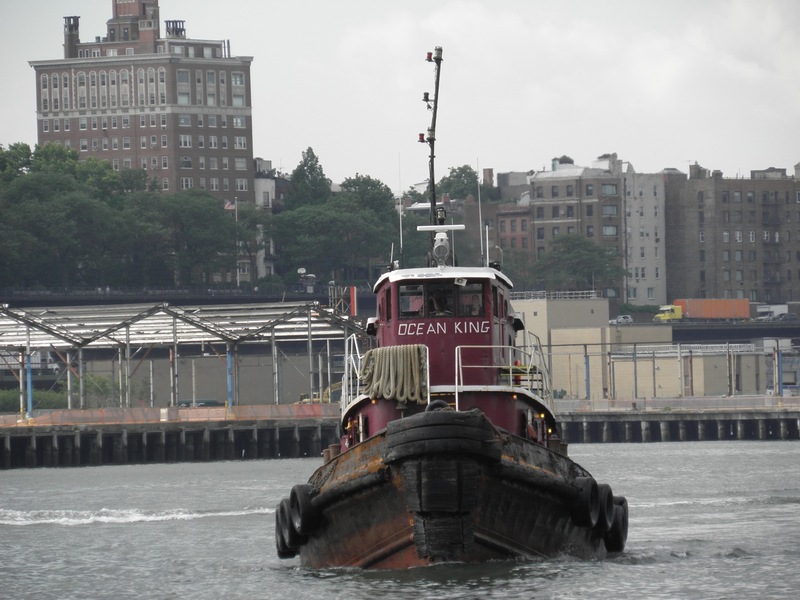 But here’s Ocean King, a foto I took back in June 2010. 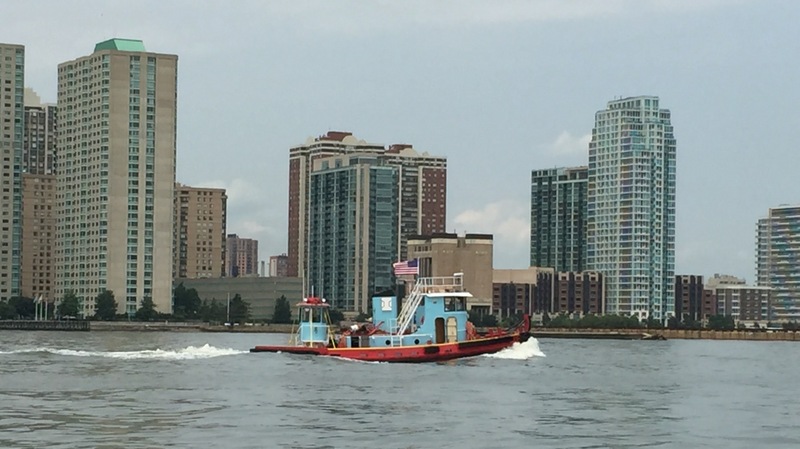 I believe she’s built in 1950, and this was the only time I saw her in the sixth boro. 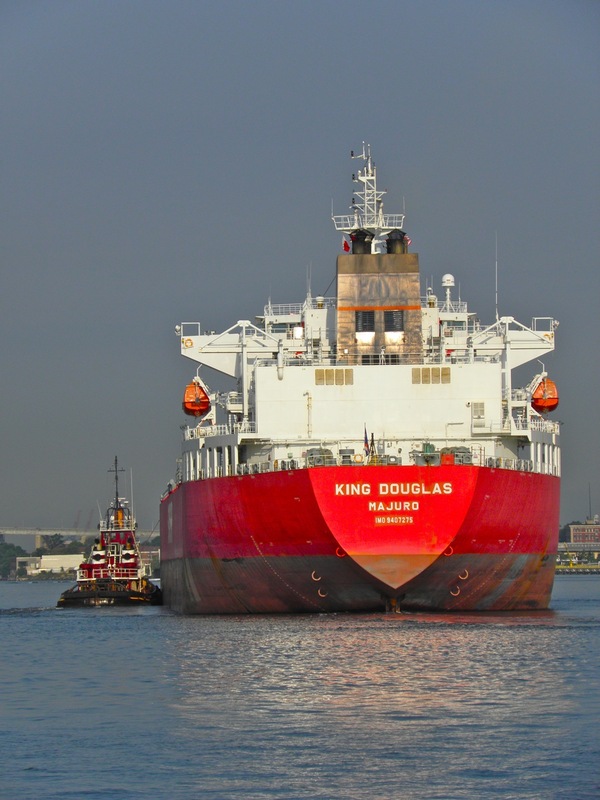 I caught this shot of King Douglas in the KVK in spring 2009; tonight she’s crossing the Andaman Sea. And finally . 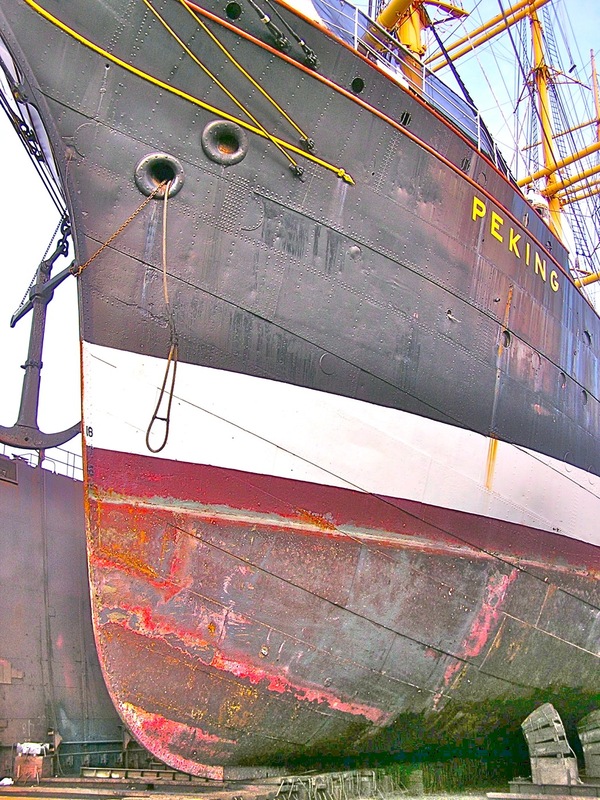 . . a stretch, I got this “below the keel” shot of Pe king back in January 2007, a whole seven years ago. 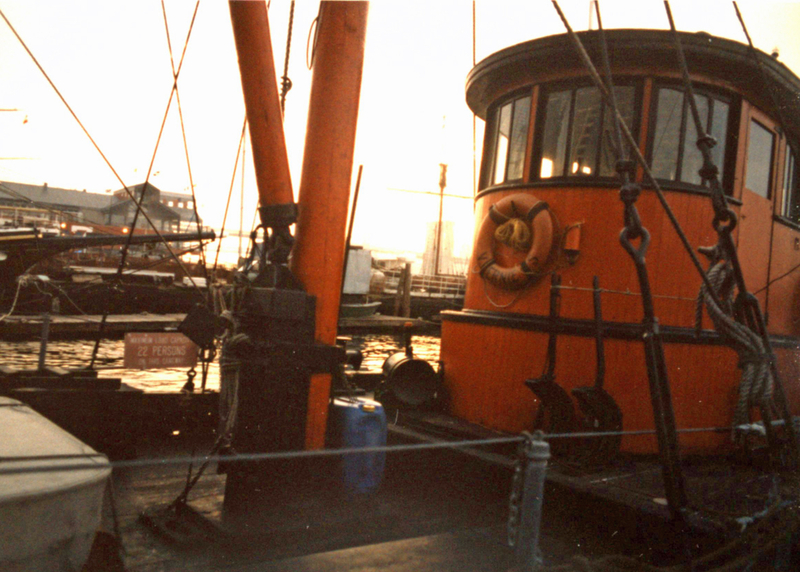 Click here to see fotos of Peking‘s first ever arrival in the sixth boro, almost 40 years ago, when there was great optimism about her future. 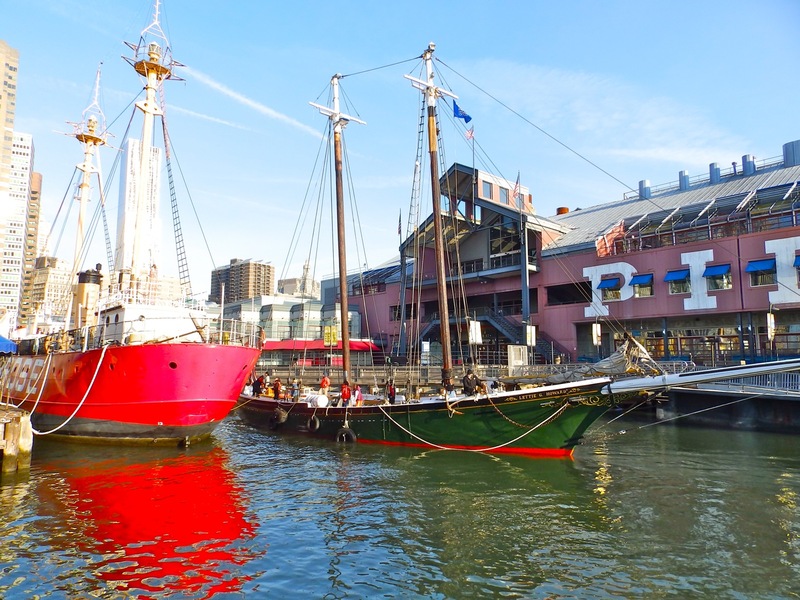 she returned to South Street Seaport Museum pier, about 36 hours travel out of Gloucester. The timing was perfect for me . 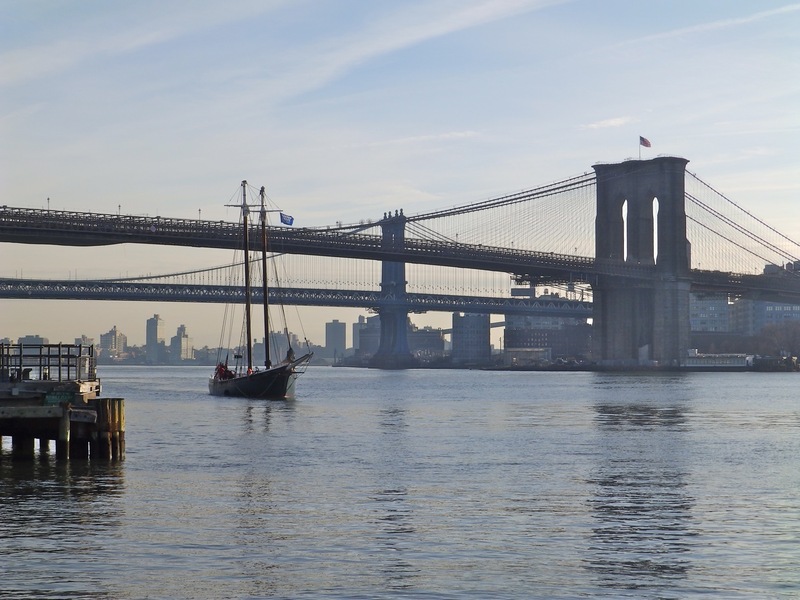 . . as I’m currently reading A Dream of Tall Ships, Peter Stanford’s account of the years from 1965–1974, when as the subtitle of the book has it, a story of “how NYers came together to save the city’s sailing-ship waterfront.” Well . . . round 1, at least. Wow! 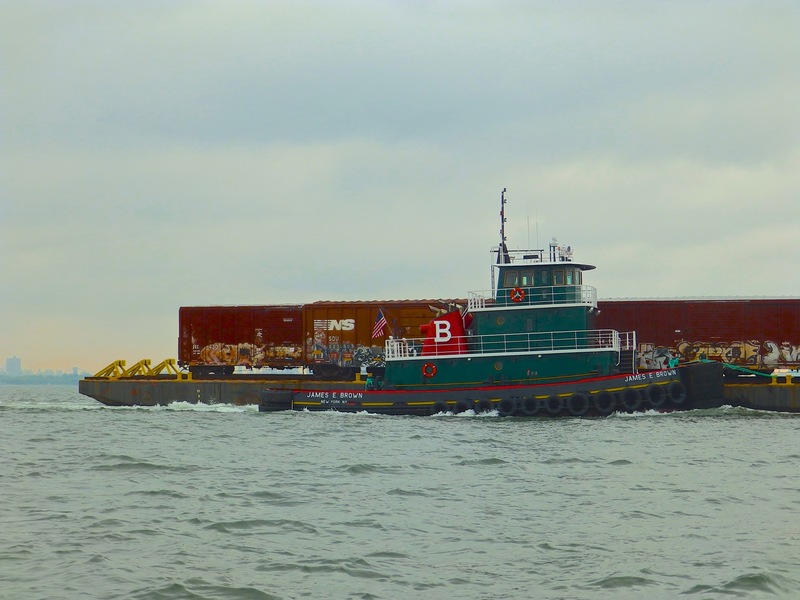 That’s one old foto I’d love to see, this vessel, with a rope bow fender, pushing a barge. Anyone have such a foto? 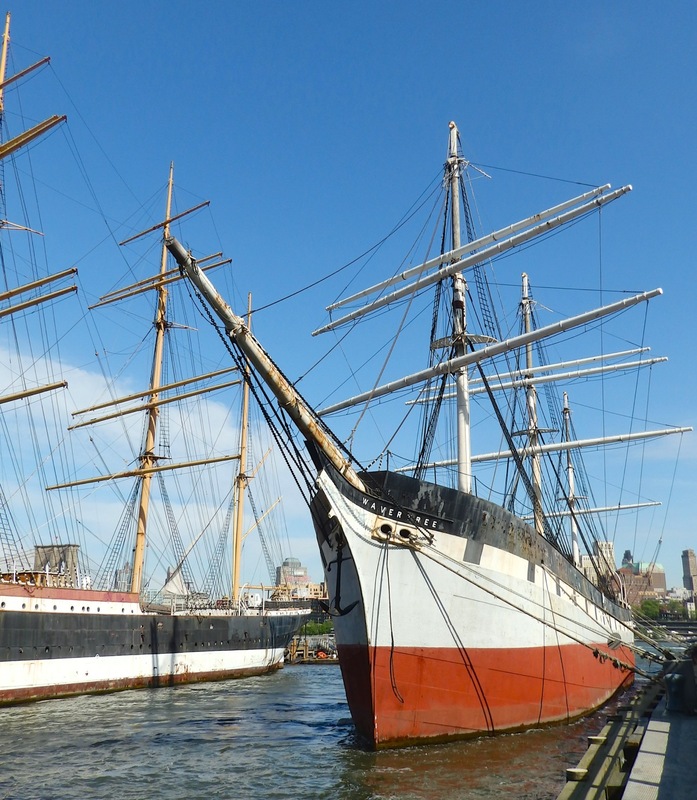 Lettie‘s back, and so is this fleet. Maybe Lettie‘d love to come out fishing with them? 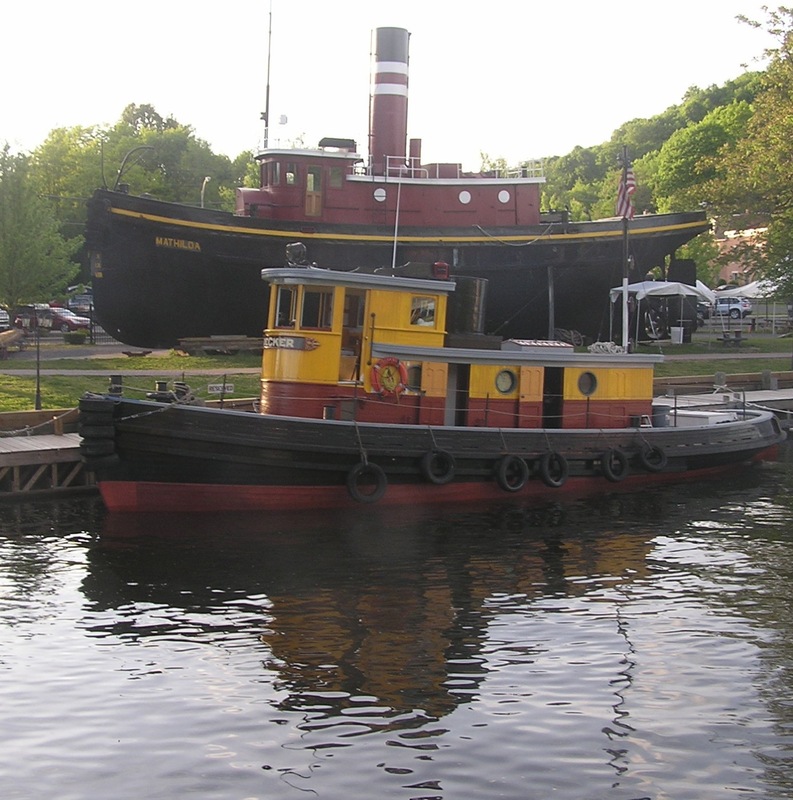 Vessel in the distance is Pati R. Moran. 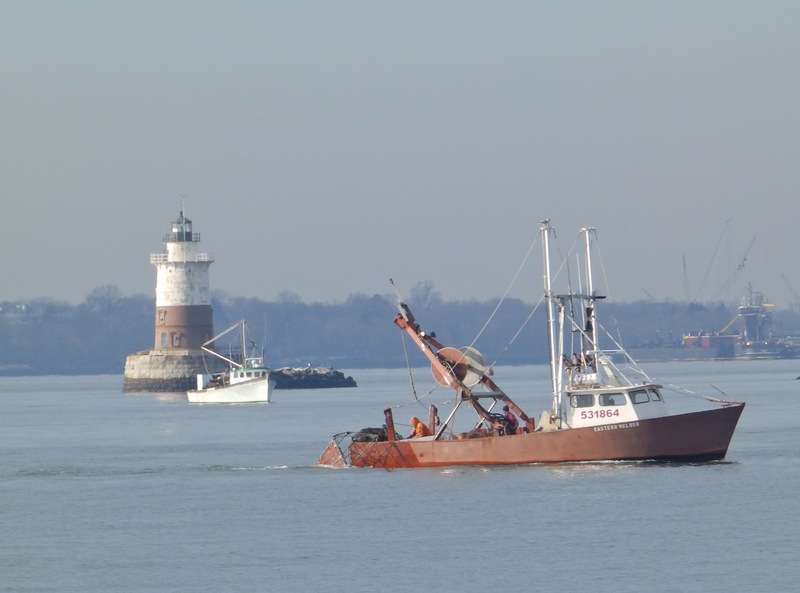 Brown fishboat in the foreground is Eastern Welder.